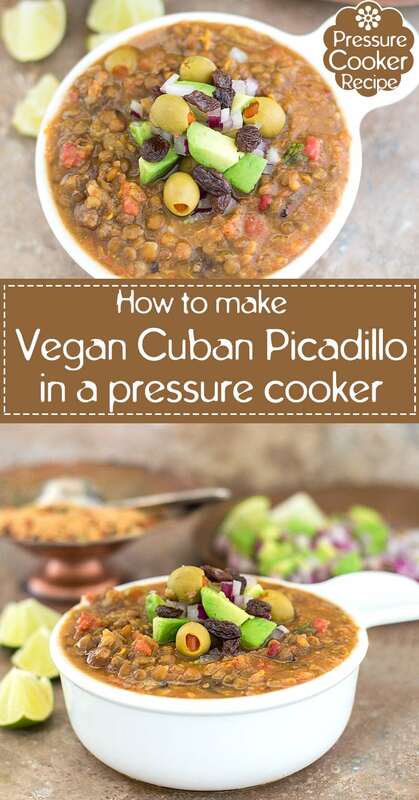 A Hearty Vegan Cuban Picadillo Made in A Bestek Pressure Cooker. Takes only 40 Minutes to Make, So, its the Perfect Weeknight Recipe. Use Lentils and Sweet Potatoes, So, its Packed with Vegan Protein. 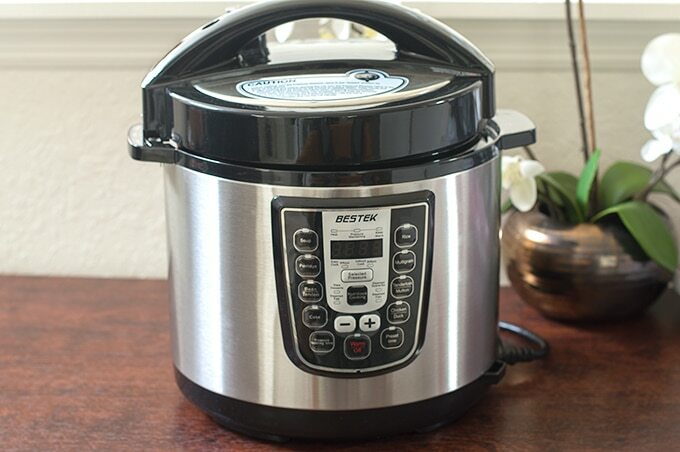 Disclosure: I was given a Bestek Pressure Cooker to use and evaluate for a recipe to be posted on my blog without any monetary compensation. All opinions are mine! I have been making pressure cooker recipes for as long as I can remember. 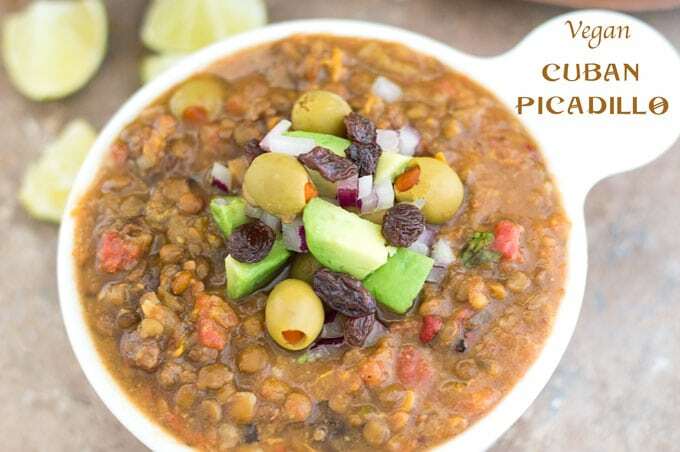 It’s such a fast and easy way to cook food, especially Indian lentils. So, when I had the opportunity to use a state-of-the-art pressure cooker, I jumped at the chance. This is one beautiful piece of machinery! To test its true strength, I decided to go with a bean based recipe and I didn’t have to look far to find a delicious cuisine! Being in Florida, I am surrounded by the very vibrant Latin community. As I walk around town, I hear conversations about food and it piques my interest! As I researched the dish, I became convinced that it would be the perfect recipe to make using a pressure cooker. Traditionally, its made with minced meat that is prepared quickly and served with beans and rice. My recipe uses lentils and potatoes. In the Bestek Pressure Cooker, these lentils and potatoes cooked up really fast. The whole process was so simple because I just threw all the ingredients into the inside container made of stainless steel. Then, I shut the lid and pressed the “Bean” button. That was the extent of my involvement. While it was bubbling and steaming, I returned a few emails and even gave myself a pedicure! There was no need for me to look into stirring it or making sure the heat was just right. The Bestek Pressure cooker took care of the whole cooking process. I made this recipe 2 times. The first time I made it, I kept it on the drier side. I wanted to see how the pressure cooker would handle a low liquid recipe. 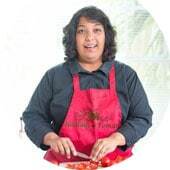 Most Indian recipes cooked in a pressure cooker are cooked with low liquid amounts. I have more vegan and vegetarian pressure cooker recipes that you can try. Let me know which one is your favorite. 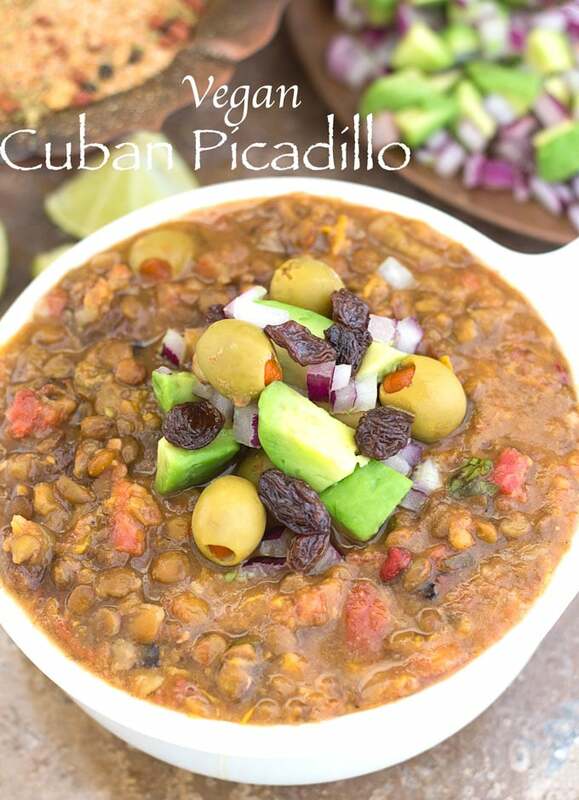 The drier version of picadillo was so delicious! I think it would be perfect to put into tortillas and make it for vegan taco Tuesday! Or how about as vegetarian nachos topping?! The second time I made the recipe, I upped the water amount by a cup and left all the ingredients + steps the same. The result? All I can say is , YUM!!!! 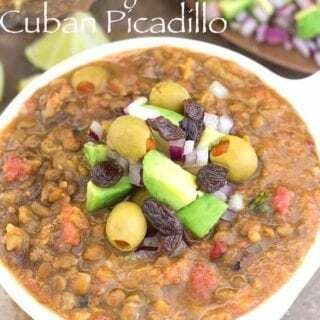 I also got to use my homemade Cuban seasoning for this recipe and it really brings out the flavors of this Cuban Picadillo. How perfect would this be on a blistering cold winter day when you just don’t feel like cooking anything because you just want to curl up in front of the fire? The Bestek Pressure Cooker kept me informed through the whole process. I knew exactly how much time was remaining. 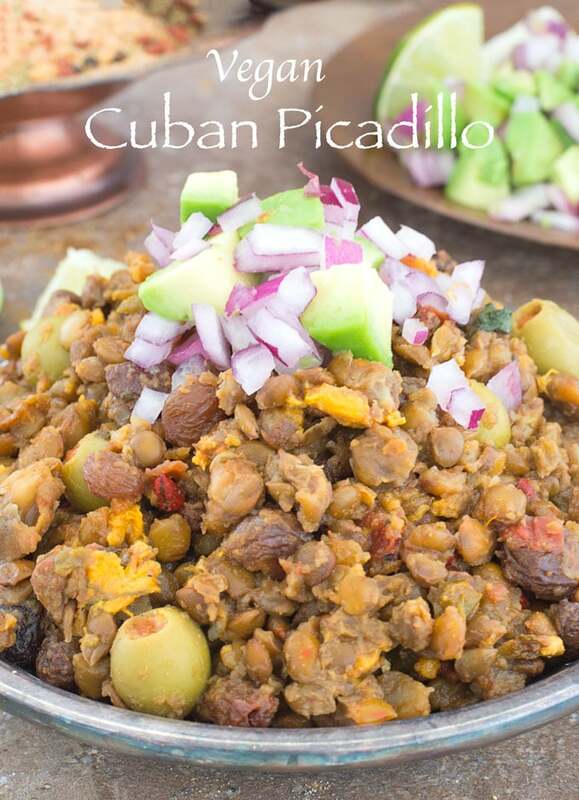 When it was done cooking the vegan Cuban picadillo, it beeped 5 times. Once the cooking was done, it went into “Keep Warm” mode and that’s where it stayed until I was ready to devour it. And devour it, I did!! Honestly, I don’t know why it took me this long to start using a modern pressure cooker! Its so easy to use and a breeze to clean up. The only thing that needed to be cleaned up was the inner stainless steel container. The rest of the pressure cooker just needed a quick 30 seconds wipe-down, even though it wasn’t necessary. 5) Its very easy to clean up. 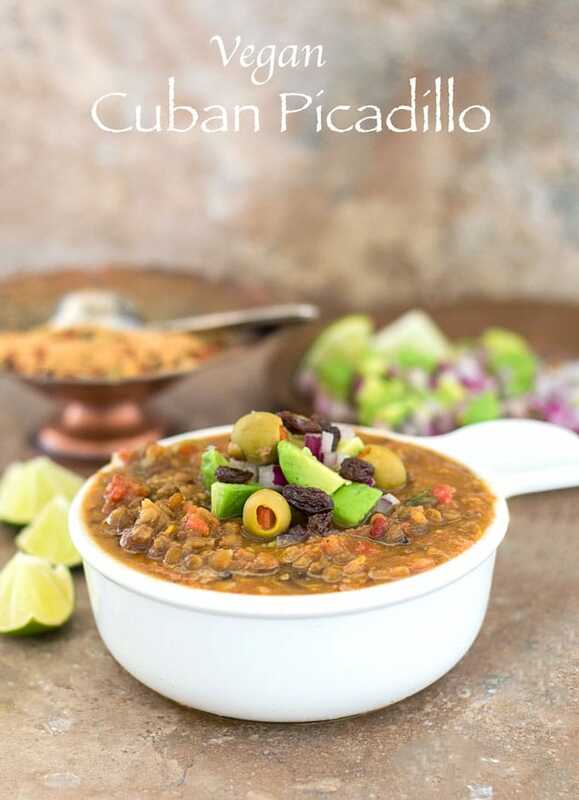 If you like veganized versions of cuban recipes, you will love my vegan ropa vieja. I am so happy to see that it’s available for purchase on (affiliate link) Amazon because I know a few people who would love to use it to make meals everyday. I already have a jump start on my holiday shopping, lol! If you have any questions or you just want to be a part of the fun Bestek Community, follow them on Facebook. You will see all the wonderful products they make and how it can make your life better. What’s your favorite pressure cooker recipe? Open the lid slowly and make sure you are not close to it. Steam will come gushing out of the cooker. Add the olives and raisins, mix and serve.